Home again and slowly getting back to normal! I'm sorry for the lack of updates but while there was good satellite coverage on the ship it was very expensive! and meeting up with the ship's Captain, Commodore Steve Burgoine, an old friend from years ago when I was working for P&O as a Woman Assistant Purser (how politically-incorrect that sounds now!!!) - he was then 4th Officer on "Orcades" when I'd just met (my) Peter who was a passenger on the same ship. Very unfortunately Peter got sick with a terrible sore throat in Bangkok and was then laid up for half the cruise with a serious infection and needed three doses of antibiotics - it really put a damper on things, and was of course especially frustrating for him. Normally February and March are our wettest months but this year January was very wet, February was drier and now we have had no rain at all for a week. Yet further south in Queensland and over to the northwest in the Gulf country they have had devastating floods and our hearts go out to the poor souls who have lost their lives and others their homes in Victoria's terrifying fires. At least while it has been dry we've been able to do lots of lawn-mowing and pruning - we are staying 'closed' to guests for a little longer so we can catch up with annual odd-jobs and maintenance. 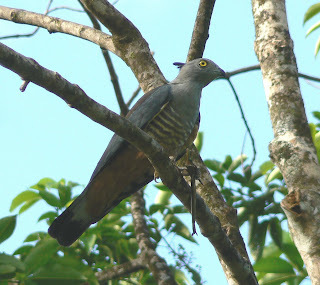 It's wonderful to see all our wildlife around us again - the Buff-Breasted Paradise Kingfishers are still here although they will soon be leaving to migrate to New Guinea, and when I strolled our walking track the other day there were three Swamp Wallabies and then I spotted this Pacific Baza (Crested Hawk). You can just see that it has something in it's claw but we can't make out what it is - being a bird of prey it could perhaps be a large stick insect or part of a small animal. This Baza was probably about 16" or 40cm in size - they grow up to 45cm with a wingspan of about 80cm. We are so happy to be home again! We love our beautiful property so much and whenever we leave it for a while we come home and see it with fresh eyes again!